Stand out from the crowd with the chic and stylish VAIO CR. Whether hard at work or relaxing at play, the VAIO CR has the head-turning looks to get you noticed. Bold, brash and confident, its innovative design reflects your life, your look and your own unique style. Choose from four luminous, lustrous finishes — radiant red, deep blue, beautiful pink or immaculate white. Whatever colour you choose, VAIO CR gives you a rich, moisture-laden, just-brushed-on look that grabs attention wherever life takes you. Whether you're active and free, passionate and romantic, bold and sophisticated, or something else entirely, there's a VAIO CR that's just right for you. Once you've chosen your look, pick the accessories to match. Get an external mouse, a mouse pad, or even a sleek, smart matching bag so you can carry your VAIO in style. VAIO CR's great looks mean you can take it anywhere — to the office, to casual get-togethers, even straight from work to play. And with all the power and performance you expect from VAIO, your own personal collection of pictures, sounds, messages, contact lists, creative works and more are always close to hand. 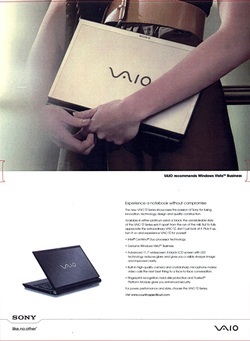 So go ahead, grab your VAIO and go! Your VAIO CR is attractive and stylish, but there's lots more to this notebook than just great looks. The VAIO CR comes with all the power and performance you expect from a sophisticated, fully-loaded notebook. · Intel Centrino technology means you can push your VAIO to the limits. · Exclusive multimedia buttons let you enjoy music or video without even turning your computer on. · Designer keyboard with big, bold buttons and unique non-business letter font looks great and feels terrific. · Bluetooth and a 1.3 mega pixel camera captures special moments and keeps you in touch. · Standby snorer and pulsating glow light. For power, performance and style, choose the VAIO CR, make it your own, and be like no other.